We have several quality stallions standing at stud. Gogarty was a 16.1 hand Irish Thoroughbred stallion. He was sired by Tate Gallery (Northern Dancer x Fairy Bridge), and out of Brews Bridge (Thatching x Little Bitty Tear). Gogarty was a Stakes-placed winner in California and Ireland with earnings of $486,027.00. Gogarty won 19 races from 6.5 to 9 furlongs on dirt and turf, including consecutive one-mile events at Hollywood Park in 1:34.1. Gogarty is by European Leading Sire Sadler's Wells' G1 -- winning brother Tate Gallery. Temper is currently being ridden so may not be available for breeding. Contact for stud fee on Temper. Contact for stud fee on Tantrum. Well Said is a 16.3 hand 2003 registered Thoroughbred brown stallion. Well Said is sired by Aptitude (A.P Indy -- Dokki), and is out of Few Choice Words (Valid Appeal -- Allouette). Well Said is a Grade 3 Stakes placed winner with 10 starts, 3 wins, 2 places, 2 shows, and career earnings of $128,060. Well Said twice defeated Brilliant, Grade 2 stakes winner and Grade 1 stakes placed winner of $726,797. Well Said was 3rd to Master Command and Patriot Act in the Mineshaft Handicap Grade 3 (8.5F), defeating Purim, Grade 1 stakes winner of $928,543. Well Said was 4th to Lawyer Ron, Red Raymond and Steppenwolfer in the Rebel Stakes Grade 3 (1 1/16 miles), defeating Kip Deville and Private Vow. Well Said is sired by Aptitude (A.P. Indy -- Dokki). Aptitude is a multiple Grade 1 winner of $1,965,410, winning the Jockey Club Gold Cup- G1 and the Hollywood Gold Cup- G1 and placing in both the Kentucky Derby- G1 and the Belmont- G1. As of late 2009, out of 367 foals, Aptitude had 279 runners, 185 winners, 44 two year old winners, and 10 stakes winners, with earnings of over $13 million. Aptitude sired two Kentucky Derby contenders in his first two crops, including Steppenwolfer ($653,459). Aptitude is also the sire of Great Hunter, Grade 1 winner of $970,500. Aptitude is sired by A.P. Indy (Seattle Slew -- Weekend Surprise). A.P. Indy was multiple Grade 1 Classic winner of $2.9 million, and was Eclipse Champion 3 year old male in 1992 and 1992 Horse of the Year. A.P. Indy was inducted into the Hall of Fame in 2000. A.P. Indy was a $2.9 million yearling, the most expensive price of the year. A.P. Indy has sired 1,054 foals, 808 runners, 572 winners, 150 two year old winners, 23 two year old stakes winners, and 135 stakes winners, with total progeny earnings of over $111 million, with average earnings per starter of over $137,000, and is the sire of 10 Champions. Aptitude is out of Dokki (Northern Dancer -- Alluvial). Dokki is the dam of 12 foals, 9 runners, 6 winners, and two stakes winners. Dokki is the dam of Aptitude, multiple Grade 1 stakes winner of $1.9 million, as well as Sleep Easy, Grade 1 stakes winner of $463,654. Well Said is out of Few Choice Words (Valid Appeal -- Allouette). Few Choice Words started 6 times with 3 wins and 1 place, winning $76,408. Well Said, Grade 3 stakes placed winner of $128,060. Silent Valor, Grade 3 stakes winner of $144,180. Miss Jeanne Cat, stakes winner of $52,754. Miss Jeanne Cat is the dam of a 2004 colt by Officer that sold for $240,000 as a yearling at auction. County, winner of $146,860, and sold at Keenland for $112,000 as a weanling. Aitcho, winner of $161,100, and sold at Keenland for $435,000 as a yearling. Few Choice Words is sired by Valid Appeal (In Reality -- Desert Trial). Valid Appeal was a Grade 2 stakes winner of $201,734. Valid Appeal sired 790 foals and 88 stakes winners, including 21 Group or Grade 1 stakes winners, and at the time of his death, had progeny earnings of over $45 million. Valid Appeal was one of Florida's all time leading sires and a world class broodmare sire. Valid Appeal's daughters have produced Champion and Breeder's Cup Filly and Mare Turf Grade 1 stakes winner, Perfect Sting, Canadian Champion, Exciting Story, and Grade 1 stakes winner, Sydney's Dream, among others. Few Choice Words is out of Allouette (Proud Birdie -- Madame Defage). Allouette was a winner of $55,146. Allouette produced 14 foals, 11 runners, 9 winners, and 1 stakes winner. Allouette produced Nannerl, multiple Grade 2 winner of $553,465, and the only full sibling to Few Choice Words. Nannerl sold in foal to Storm Cat for $1.25 million, and the resulting foal sold for $850,000. Allouette's daughter, Etoufee, produced Earth Living, winner of $714,637. Allouette's daughter, Wild About Bridget, produced Kapanga, winner of $147,600 in 7 starts. Well Said's 3rd dam, Madame Defage, was a stakes placed winner of $45,427. Madame Defage produced Fact Finder, multiple Grade 1 winner of $849,231. Well Said is correct, leggy, extremely good looking and a huge mover with a sweet attitude. Maxamax is a 16 hand 2000 registered Thoroughbred grey stallion. 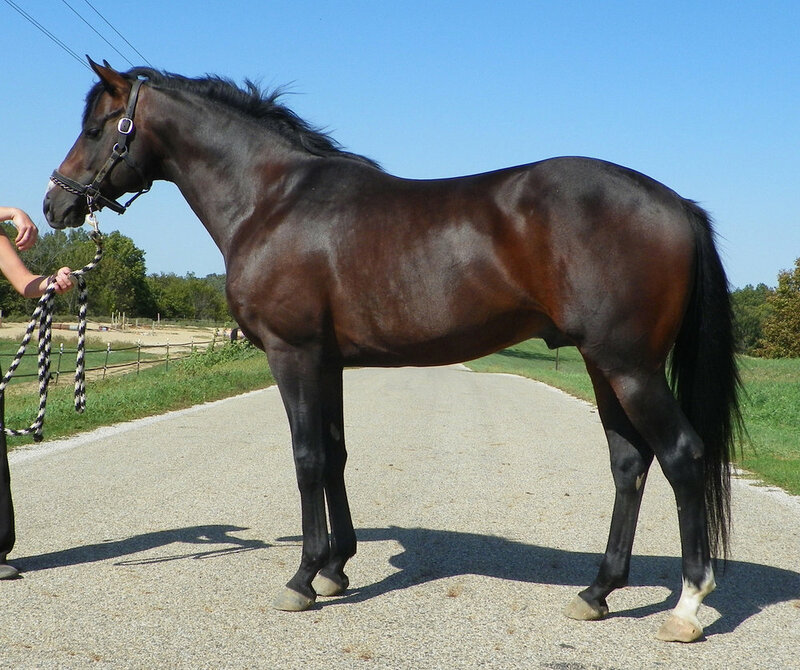 Maxamax is by the great Mr. Prospector (Raise A Native -- Gold Digger, by Nashua), and is out of Maxzene (Cozzene -- Jacky Max, by Sexton Blake). Maxamax sold for $800,000 as a yearling at auction. Mr. Prospector is arguably one of the greatest sires of the 20th century, siring 181 stakes winners.